Van Heck has the ideal solution for irrigation, drainage and other needs for water displacement. And it’s really simple too. 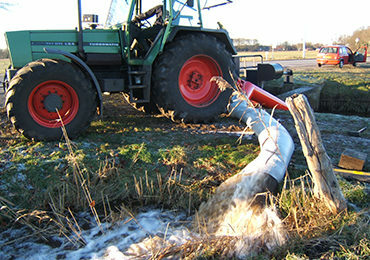 The screw pump is ideal for deployment on agricultural and hard-to-access terrains. The screw pump operates in dirty water without any problems. Its simple design enables the lightweight pump to be transported and put into operation quickly and easily. The screw pump can be attached to the lift of a tractor. This can then simply be used to position the pump where it is needed, at an angle of up to 45 degrees. It can also be driven by a separate diesel engine. Solid housing and broad screw width. Attains a flow rate of up to 2,100 m3 per hour. The screw pump can be supplied with a towable trailer. Van Heck has developed an electrically powered screw pump. This is really useful if you need a more permanent solution. The electric motor, in conjunction with a frequency regulator, achieves no less than 94% efficiency at minimum power. Moreover, the motor is extremely quiet.